ARLINGTON, Texas - Shabazz Napier looked up toward the Connecticut fans in the crowd at AT&T Stadium and held up one finger. The Huskies had just beaten overall No. 1 seed Florida 63-53 on Saturday in the Final Four. But Napier's gesture had another meaning. "One more to go," the first-team All-American said. The victory got them into Monday night's title game against the Wisconsin-Kentucky winner and it was as good as any team came up with this season against the Gators, who came in having won 30 straight games, a streak that started after a loss to the Huskies four months ago. "We have been in a lot of dog fights," Napier said. "We are just an experienced group. We believe in each other and continue to believe in each other. ... We are going to win. That is what we do." The Gators lost only three times this season - once to Wisconsin in the second game of the season and twice to the Huskies. The first time was on Dec. 2 when a foul-line jumper at the buzzer by Napier gave UConn a 65-64 victory. They didn't have to wait that long to know they had this one. The Huskies, the seventh seed in the East Regional, had outstanding games on both ends of the court. Napier helped seal this game with about 2 minutes to play when he made two free throws for a 59-47 lead. That margin was the deficit the Huskies (31-8) faced in the opening minutes after a cold shooting start. "I knew we was going to get back in the game. They knew we was going to get back in the game," second-year coach Kevin Ollie said. "We live and die on defense and hopefully everybody understands that." With Ollie in a defensive stance himself most of the game, the Huskies sidetracked the Florida offense by shutting down point guard Scottie Wilbekin and 3-point specialist Michael Frazier II, who scored a combined seven points. "UConn was very good with their pressure on our guards and we didn't convert points," Florida coach Billy Donovan said. "They scored a lot on as well. So all the credit goes to them." The Huskies were impressive on offense, shooting 55.8 percent (24 of 43) from the field against a team that allowed opponents to shoot 39.9 percent this season. "Whomever I put in the game, it was positive and they were productive," Ollie said. DeAndre Daniels had 20 points and 10 rebounds for Connecticut, and it was his two 3-pointers in a span of 1:43 that helped ignite the Huskies after they had fallen behind 16-4. "DeAndre was huge for us," Ollie said. "He stepped up and really rebounded for us and was pretty much unstoppable." Napier, who leads the team in almost every category, finished with 12 points and six assists. He definitely got the better of Wilbekin in a matchup of senior point guards, both conference players of the year. 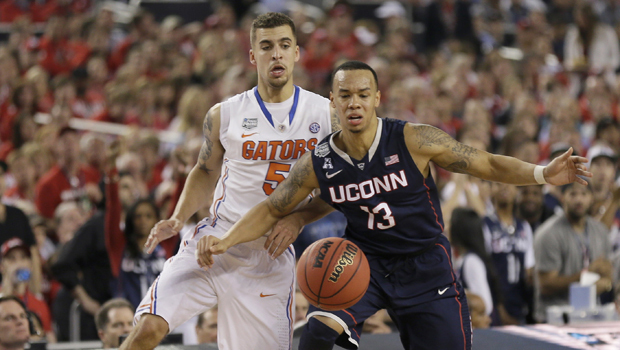 Napier had two key second-half steals on Wilbekin, both of which led to UConn baskets. Wilbekin was bothered by cramps throughout the game. "It was right when the second half started. I was getting a little cramp, it wasn't too bad," Wilbekin said. "I got out of the game and got some ice and it wasn't really a problem from then on." The Connecticut guards were. Florida had 11 turnovers and a season-low three assists. "That's crazy, that's not usually what we do," Wilbekin said. "All credit goes to them and their guards and the way they were denying and putting pressure on us." Patric Young had 19 points for Florida (36-3), which had won all of its NCAA tournament games by at least 10 points. The Gators shot just 38.8 percent from the field (19 of 49), well off their 46.1 percent average. "Once they got their defense set, I thought we had a hard time dealing with their pressure up top," Donovan said. The Huskies used 3 pointers to open things up inside, hitting 5 of 12 from long range. They had such an easy time scoring inside that they had only one basket outside the paint in the final 20 minutes, shooting 63.6 percent (14 of 22). Florida was just 1 for 10 from 3-point range and the Gators' most effective weapon through most of the game was an offensive rebound off a miss. They had 12 in the game and turned them into 13 points. Florida's defense - which was No. 3 in the nation - was suffocating early and the Gators took a 16-4 lead with a 7-0 run that was capped by a drive by Wilbekin with 9:47 to play. The Huskies suddenly found their shooting touch. Connecticut made four straight shots and three of them were from beyond the 3-point line - two by Daniels and another by Ryan Boatright. A drive by Napier gave the Huskies the lead for good, 23-22 with 2:20 left in the half. In the second half, the Huskies stretched the lead to 59-47 with 2:04 left, turning the 12-point deficit into a 12-point lead. They are in the title for the fourth time, the first three all wins under coach Jim Calhoun. Florida was looking to reach the national championship game for the first time since repeating as champions in 2007.